Momma Told Me: Don't go messing up your new shoes! As a child one of our first reactions to a new piece of clothing is to show it off. If the article in question just happens to be a new pair of shoes, chances are we're enamored and will refuse to take them off, even for bed. I had a friend who felt this way about her hot pink rain boots, in the 3rd grade, and recall she wore them for months on end with pride. In our house, we typically went shoe shopping once a year, right before the new school year, or when my feet seemed to magically outgrow the last pair. Because of the rarity of this event, I was always especially proud of my new 'kicks', which had a tendency of being white in hue. I'd, never fail, to find the muddiest patch of our school lawn and kick up enough dirt and mud to bring them home in a different color. Momma, furious as she scrubbed them in the sink, would warn me she wouldn't be 'buying another pair' when these looked like they'd been through a marathon in just a week. I'd scrunch up my nose in disagreement, as my shoulders fell back, and whine, "But MOM, shoes are supposed to be worn!" Little did I know, just 10 years later, ofter shelling out over $100 of my own hard earned bucks for a pair of shoes I'd only wear a handful of times, that this finicky footwear obsession would be passed down. Isn't it funny how much money and attention we put into fashion for articles which originally were designed for function and wear? I hardly see the North American natives gathered around the fire discussing how their newest moccasins required an extra glass bead for panache. In fact, the Canadian Metis utilized every aspect of their lives to not only be efficiently functional under extreme lifestyles and elements, but to celebrate the people's history and ancestors. And their deep respect for the land, and it's inhabitants, lead to an efficiently irreverent lifestyle rich in comfort and tradition. One such vital aspect of these people was the introduction of an active fur trade. With origins as far back as the 1630 fur trade establishment, the Metis founded a strong relationship for handmade fur based clothing and shoes, with local settlers and Aborigines. When Manitobah became a part of the Canadian provinces in 1870 Metis artisans learned to spread their handmade goods in an effort to solidify relations and important relationships outside their tribe. Today, in the same spirit, the 1990 based Manitobah Mukluk's brand fosters lasting opportunities for Metis tribe elders, through the commercial integration of authentic materials and designs. While each and every elegant pair of authentic Mukluks are instantly captivating, the story of these shoes continues far past fur and tread, to their very soles. Mukluks are build to be functioning art. Though you may never feel quite comfortable trekking through snowy drifts and backwoods in such masterpieces, Manitobah has designed them to be as flawlessly functional (and comfortable) as the people which inspired them. Beginning with a highly durable, and technically devised, Vibram sole, each pair of Mukluks is visually engaging and functional. As the leader in high performance, rubber based, soles, Vibram is the perfect translation of authentically rugged wear and city ready elegance. Their durable, low profile, sole is the perfect canvas for the Aboriginal story, which appears in 2 forms across the collections; TIPI and TURTLE. While Momma recently reviewed the Manitobah NAPPA Mukluks, I received a pair of (SZ 11) Women's Tall wrap, in Charcoal, for feature during Christmas Wishes. As it turns out, I had received my pair prior to Momma and quickly 'phoned' ahead to anxiously share my first impressions. When I had initially shopped the brand I was advised that, despite the size range cutting off at 11 (women's), the fit ran on the larger end and was most appropriate for feet like mine. What had arrived at my doorstep was an elegant Black and White Manitobah box, housing a complete Certificate of Authenticity. This piece of 'paper' not only serves as a proof of purchase for the discerning consumer, but outlines the brand's connection with Aboriginal-owned companies. In addition to the stockholding and partnership program, Manitobah extends their friendship with the Aborigines through authentically inspired design, with in-house artists of native descent. You'll find everything from the soles, to the hand laid bead work, is carefully consulted with ties in tradition and purpose. And, if you don't see something 'authentic' enough for your tastes, their artist, Dorothy Grieves will design a commissioned pair of one-of-a-kind Storyboots, through special order. If you're unaware of the company's roots it might be natural to overlook the treads' story upon first glance. So artistically woven into the very soles of these shoes, are the traditions, trademarks, and stories of Aboriginal people. The TIPI soles showcase the Sky, with it's life giving water from rain and snow, Western Mountains, Woodland People, and progression of modern hunter-gatherer lifestyle. Fire at the base symbolizes the perseverance of the native people, and the Swirling Four Winds, the cleansing as the Sun circles our Earth. While the Mukluks and Moccasins are designed for consumer intent, those looking to have a more personal and impactful connection to the Aboriginal people can commission Manitobah's Edna Nabess designed Storyboots. Storyboots are truly one of a kind works of art made from authentic materials by hand. Available in Tall and Short, the Charcoal Wrap Mukluk is a very rustic, and authentic, visual expression of nomadic footwear. Manufactured in Chocolate, Charcoal, Black, and Olive, these Cowhide Suede, and Rabbit Fur boots feature an ultra plush (and insulating) Sheepskin Shearling lining that gives the effect of walking on air. Surprisingly, the Vibram soles are incredibly flexible in walking and movement as well. The company suggests sizing down 1 entire size when ordering, and as a natural 12, I was glad to find these (11s) fit quite well in the foot. However, the Tall Wrap has a tie up assembly, which seems to be less kind on my toned calves. While the wrap itself closes to the seams, they're best worn over jeans or leggings for a more casual look. I should also note here that Manitobah does make every effort to work with sizing (as far as stock, or custom order) for those outside the current selection options. Some may be mortified to find I chose to take my Charcoal Tall Wrap Manitobah Mukluks to the local beach; but I desired a more natural footwear experience. After all, the Aboriginals wear their second skin footwear through extreme conditions and through long days. In honesty, I can't blame them, they're impressively comfortable! I am typically not a fur person, and often go the Vegan route, but the authenticity of Aboriginal design and practice, coupled with the ethical luxury is a very strong argument for Manitobah elegance. I love the casual tie up wear, and the minute details of beauty (such as the beaded accents and pops of turquoise). Mukluks are truly the perfect surprise for any discerning recipient on your list this holiday season! What Daughter Says: Mukluks will withstand daily wear with durability and rugged elegance. They're the story of an entire people, and the pride of any footwear collection! 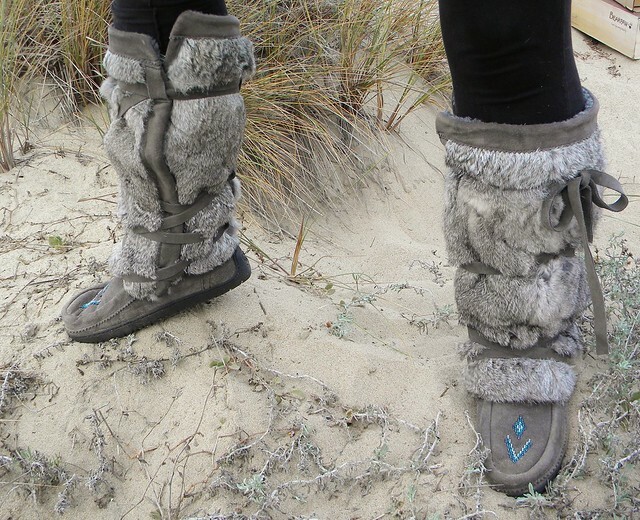 One very lucky Momma Told Me follower will win a pair of Manitobah Mukluks of choice (SRV up to $389)! I would love the Tall Wraps for added warmth and the design of them is awesome too! I like the Tall Wrap in charcoal...they look soooo toasty warm! oh wow, im gonna have to eventaully get a pair of these, they would go perfect with a spirithood, i love them, esp the ones your are wearing. I like the Gatherer Tall with Crepe Sole in tan. I love these!! I like the Tall Wraps in any color. I like the tall classic mukluk with crepe sole! The short wrap mukluks. These are so precious! My favorites are the Buffalo Dancers! Oh I love the Tall Wraps like the ones you are wearing! I like the Charcoal Tall wraps! I like the Metis Mukluk in Black. I LOVE the Metis Muckluck! I love the Metis Mukluk! Very pretty! Thanks! I'd love to get the Buffalo Dancer for my daughter. She's been wanting boots like that. I like the Tall Wrap but it was VERY hard to choose. I would love to win the Metis Mukluks in tan, wow they are Beautiful! Love the Coyote Mukluks too! They are All Beautiful, I have always loved the look of Mukluks. I like the Tall Wrap! Pretty sure I would cry if the Tall Wrap in charcoal showed up on my doorstep! LOVE THESE!!! I like the Gatherer Mid best! I love the Tall Wraps in the chocolate color. I have been telling my husband I want the Tall Wrap Mukluks in Charcoal for Christmas since July. Perfect for Minnesota winters!! I want the chocolate Tall Wraps. I love them all for different reasons, but my favorite is the Metis Mukluk with Crepe Sole. I love the flower pattern! I love the Hunter Mid Mukluks! Great product...I bookmarked the page so I can go back and look around so more :) Thanks for the giveaway! Love teh mid-gatherer in Stone! I love the Tall Wrap in Black or the Charcoal! LOVE the Deerskin Mukluks - the yellow leather is gorgeous with the wheat design! I like the Tall Classic Mukluk in Charcoal, they'd be great apre ski! OMIGOD the Tall Wrap in Charcoal Grey. I flipped when I saw these on the email. I guess you can see why I was so anxious to resolve any page loading issues :) LOVE LOVE LOVE these boots!!! 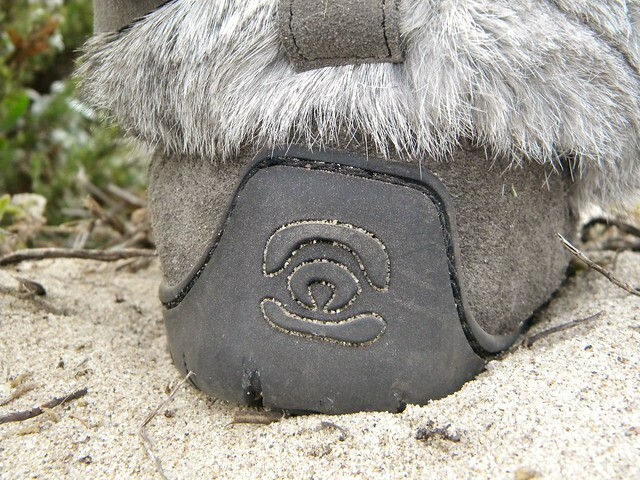 Oh I love the Short Wrap MukLuks in Charcoal! Sooooooo cute! Oh the chocolate is cute too! Hello, oh my I love them all but my favorite is the Gatherer Mid in Russet. Thanks for a great giveaway! Sigh I love the tall wrap and the Metis with crepe sole both are drool worthy! Their Storybook Annie McKay Mukluks caught my eye to have! Oh my gosh. So cute. I like the Edna Nabess Mukluks, but I really like the ones you're wearing. Metis Mukluk with Crepe Sole in charcoal. Thanks! I love them all but if I won and had to choose, I'd probably go with the Metis Mukluks because I love the color and design. I really love the Hunter Mid. We don't have cold weather here very much and these I could wear even in the warmer weather. I love the Metis Mukluk with crepe sole. So beautiful and comfy looking! Also wish I could get the children's ones for my daughter. I really love the tall wraps... and coyote. I don't know, I like all of them! I love the gray Tall WRap! I love the tall wrap in olive! I'd get the Hunter Tall in Copper. I love their Tall Wrap Mukluks in Chocolate. I love, love, love the Metis Mukluks!!! Love the Metis Mukluk in Charcoal! I'd love the Tall Wrap Mukluk or the Short Wrap Mukluk! I absolutely love the tall wrap mukluk, but I also like the metis mukluk. I love the Gatherer tall in russet!! They are all so beautiful! I love the short wrap mukluks in charcoal. the Hunter Tall Mukluk- these seem great for our NE cold winters! Metis Mukluk 15" tall in Charcoal are my favorites! I just fell in love with the Metis Mukluk in Chocolate with the Tipi Vibram sole! I love the short wrap mukluk boots in charcoal! oooh the taller the better for this winterized, but arthritic Canadian! Gorgeous beyond belief! wow these are great love them all. But really like the Metis Mukluk. Wow great products. Love the Mid Gatherer Mukluk with Crepe Sole. I like the tall wrap mukluks. I like the Gatherer Tall Mukluk with Crepe Sole in black. They would go with everything and look so comfy! I like the Hunter Mid Mukluk. I like the mid classic mukluk with crepe sole! I really like the Edna Nabess Mukluks in the Storyboot line. But since the prize is probably not for $1400, I also like the Mid Classic Mukluk in copper. i like the Gatherer Tall Mukluk with Crepe Sole or the tall wraps! They're all so cute! I really like the Metis Mukluk's! I would love to win the tall wrap boots! perfect! I LOVE the Tall Wrap muluk!!! I also love the Tall Wrap Mukluk, but in chocolate. Tall Wrap Mukluk are so cute!! I want Mid Classic Mukluk with Crepe Sole; Black - Size 8 in the giveaway on the blog Momma Told Me ! I love the Tall Wrap in Charcoal. I definitely could use a pair of warm boots for Christmas. I am in love with the Tall Wrap in Charcoal. So beautiful. Gorgeous design!! i want the dancers in black! If I had to choose just one pair, I'd choose the Tall Wrap Mukluk in charcoal. So many cute shoes, but I really like the Metis Mukluk with Crepe Sole. My favorite is the Gatherer Mid Mukluk in black! I put the wrong link for my tweet! It should be https://twitter.com/#!/hunniebee724/status/140904511828013057. Sorry! 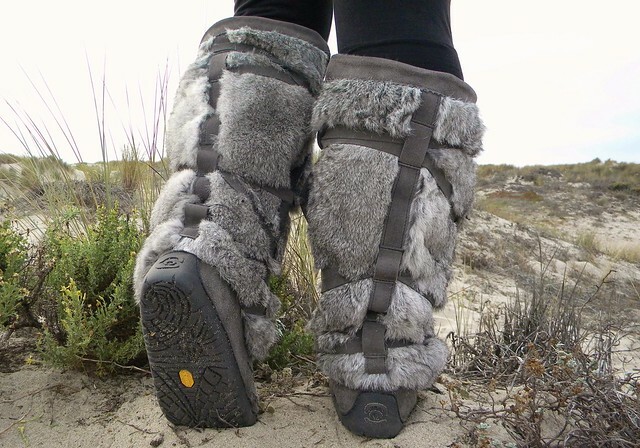 I love the Tall Wrap Mukluks in Charcoal, they are gorgeous boots. I want to marry the Coyote Mukluk! Or the Tall Wraps! I like the children's mocassins. i like the buffalo dancer mukluks! My fave is the Tall Classic Mukluk with Crepe Sole. I LOVE the Tall Classic Mukluk. I love the tall wrap mukluk! I love the Short Wrap Mukluk! I need a tall boot so I'd go with the Tall Classic Mukluk with Crepe Sole. The Edna Nabess Mukluks are so beautiful! I love the Metis Mukluks with Crepe Sole! i like the nappa mukluk. thank you! I love the Charcoal Grey Tall Wrap Muks. They look so comfy! The Edna Nabess Mukluks look very nice! My name is Bill. I am looking for a women's tall gather mukluk with crepe sole in a size 11 womens. I like in the states(USA) I have type 2 Diabetes and my feet get pretty cold in the winter. If any body has a pair of tall wms gather's in a size 11 in decent shape that they would like to sale please email me at cozette49008@g.mail.com. I would love to get a pair. MI winters are very brutal. Please help a senior citizen too keep warm. Thank You and Good Bless You. bj. I love the tall ones you are wearing in the photos! They would be perfect for the Colorado Snow!